Begin your routine with the movements labelled "1", "2", "3", and "4"
Lie on your back with your knees bent and feet flat on the floor. Without arching your lower back, slowly attempt to press the back of your neck against the floor - your chin will tuck into the front of your neck. Hold for 10s, gently release, then repeat for 3 reps. 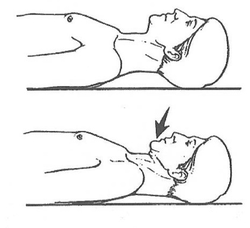 Perform the chin tuck as above. 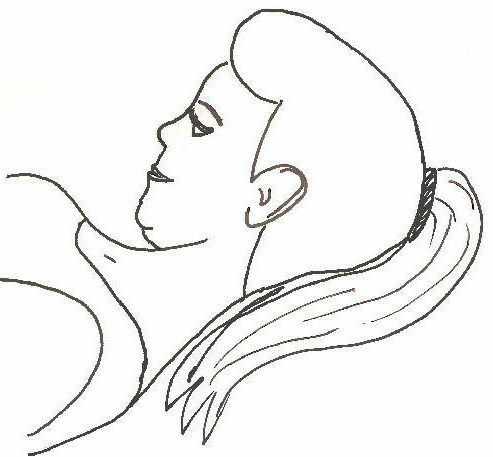 Holding the tuck, slowly lift your head off the bed using the deep front neck muscles instead of the bigger superficial muscles beside your throat (touch them with your fingertips to check). Hold for 5-15s, then gently release. Sit up straight with feet on the floor & arms at your sides. 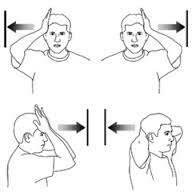 Holding your neck in a neutral position, press one hand against your forehead while you resist the pressure with your neck muscles so that the head/neck stay still. Only press as hard as your discomfort will allow. Hold for 5-15s, then gently release. Now press one hand on the side of your head while resisting for 5-15s. Then do the same while pressing on the other side of the head for 5-15s. And finish by pressing on the back of the head for 5-15s. Sit up straight at the edge of your seat with feet on the floor & arms at your sides. As you take a deep breath in, lift your chest up towards the ceiling, squeeze your shoulder blades together, and pull your shoulder down away from your ears. Pause for beat, then exhale and return to the start. Repeat for 3-5 breaths/reps. Perform the chest lift as above, but also pull your arms apart and back at shoulder height at the same time. At the end of the movement turn your thumbs up and squeeze your shoulder blades together. Repeat for 8-10 reps. 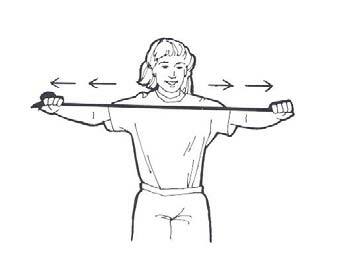 Hold a resistance band between both hands to add difficulty. Sit up straight with feet on the floor & arms at your sides. Slowly lift your shoulders up towards your ears and squeeze for 2s, then pull them back and squeeze for 2s, then bring them back to the start position. Repeat the circle for 10-15 reps. Hold weights in the hands to increase difficulty. 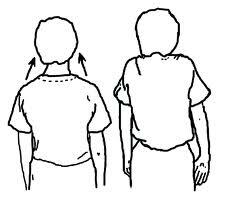 Stand with your back against a wall & hands held up at shoulder height with elbows bent. 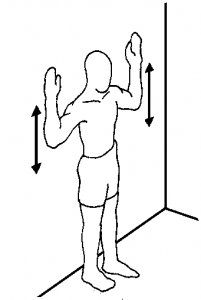 Squeezing your shoulders blades back, slowly lift your hands up towards the ceiling and squeeze your shoulders towards your ears for 2s, then bring them back to the start position. Repeat for 10-15 reps. Hold weights in the hands to increase difficulty. Once you are have started to progress through these, and have seen improvement in your abilities, it is time to move on to more general strength training. It is still important to maintain the stability gained from these exercises so incorporate them into your routine. 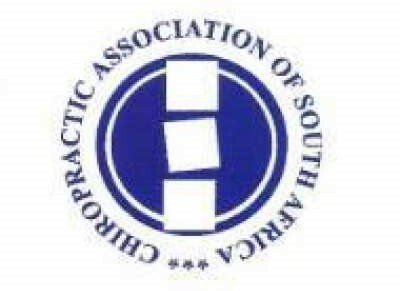 Ask your chiropractor how. Thank you for reading – please Like/Share if you found this useful.